UND President Mark Kennedy visits with attendees of the annual Thanksgiving dinner for retirees event, held recently in the Memorial Union Ballroom. Pictured left to right, are Kay Roch, Larry Roch, Richard Olson and Jan Olson. Special to UND Today by Richard Larson. 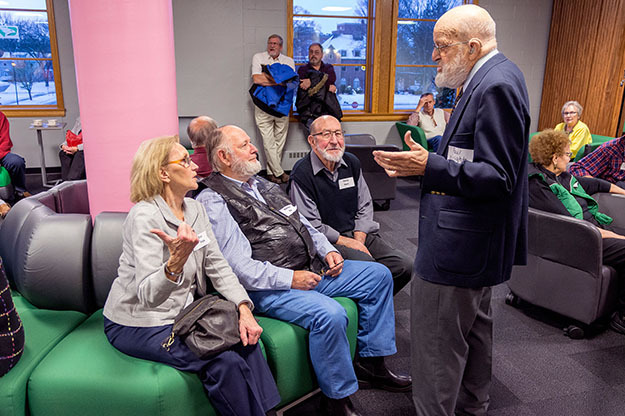 It was all smiles and a lot of laughter as UND retirees caught up with old friends and heard about what’s happening at UND. A traditional Thanksgiving meal was the gravy on top. UND’s annual Thanksgiving dinner for retirees took place Nov. 6, and drew about 250 former members of the University community. And, said everyone, the food was outstanding. 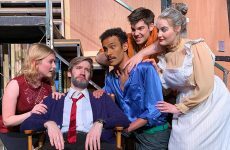 UND Catering served up a traditional Thanksgiving meal including lefse, a Scandinavian delicacy which passed the taste-test of even the most demanding palates. “It’s so good to see everyone again!” said catering supervisor Karen Bushaw as she and her staff made their way around the tables. The annual dinner event, one of UND’s longstanding traditions, began in the 1970s during the Tom Clifford presidency. It’s a way to keep retirees engaged with the University, and to thank them for contributions to UND’s success. Pictured above left to right are Evi Fox, Richard Fox, Hanzy Horn and Paul Wright. Special to UND Today by Richard Larson. The event, one of UND’s longstanding traditions, began in the 1970s during the Tom Clifford presidency. It’s a way to keep retirees engaged with the University, and to thank them for contributions to UND’s success, said Fred Wittmann, director of ceremonies and University events. “It would have been very much like President Clifford to have understood the value of having UND retirees living in the Greater Grand Forks and surrounding communities to maintain some direct connection to the campus,” said Wittmann. 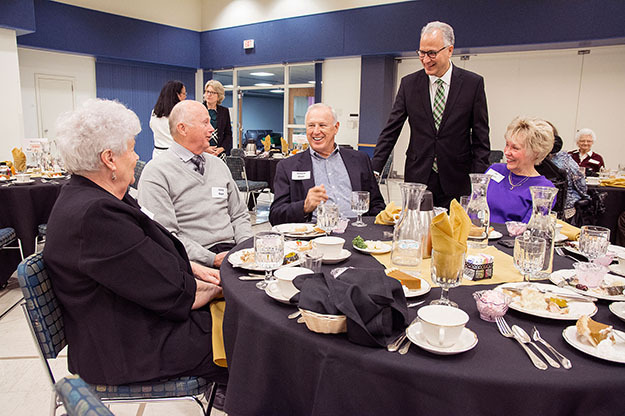 President Kennedy continued the tradition as he and First Lady Debbie Kennedy mingled during the social, welcomed retirees, talked about what’s happening at UND, and circulated after the dinner. “This is our opportunity to say thank you for all you’ve done for the University,” said Kennedy as he addressed the guests. Another way UND is moving forward is through branding and its Leaders in Action message, which was developed through surveys and focus groups within the University community, Greater Grand Forks, and with prospective students. “We asked people what words came to mind when they thought of UND,” Kennedy said. “And quality education almost matched hockey! Kennedy said that “beautiful campus” scored almost as high as “cold weather” in the survey. “Prospective students decide within seven minutes if they want to attend a university,” Kennedy said, adding that UND is “buffing up” the campus and making other improvements. Other words that people associate with UND included “doers,” “rugged,” and “making an impact,” Kennedy said, adding that UND’s new tagline, Leaders in Action, rings true and describes what makes UND special.